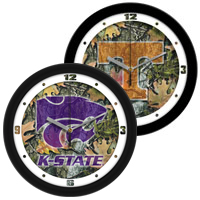 Demonstrate your team spirit in your home or office with your favorite college logo. Our 12�Camouflage Wall Clocks feature a quartz accurate movement. Unlike plastic wall clocks, you experience superior visibility with our mineral glass crystal. The printed ring on the crystal displays the numbers.